vegetable processing and everything in between. TKN – Total Kjeldahl Nitrogen, or the total concentration of organic nitrogen and ammonia. in ppm (mg solids per liter of water). Processors can gain significant savings with the Double Drum Screen two-in-one screening system to reduce industrial waste and increase product recovery. The Double Drum screen combines .080″ primary and .020″ secondary screening into one machine. Operators can save space, costs and time by eliminating the need for two single-stage screens. 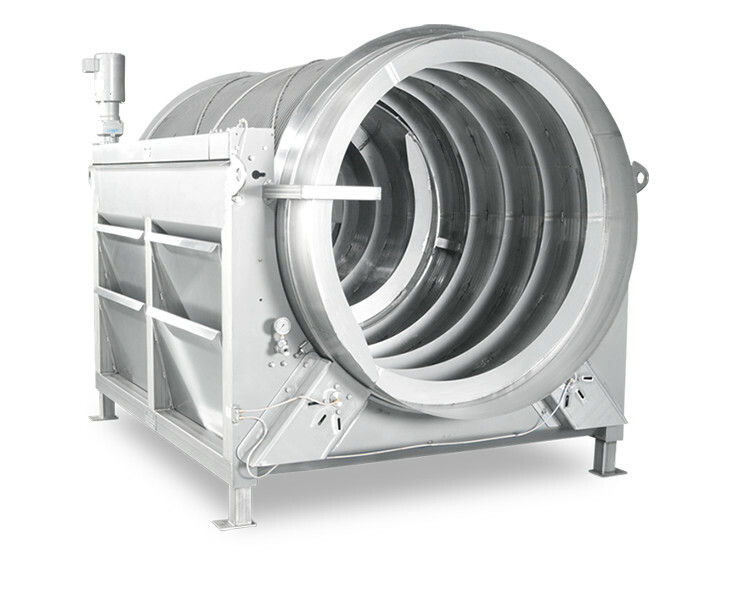 Effective with poultry, vegetables, potatoes, fruit or snack food processing, the Double Drum screen offers durable, rugged construction and an established reputation for successful, reliable use in the industry. Users call this the best wastewater screen in the world. Processors can gain significant savings with our Single Drum Wastewater Screen to help reduce industrial waste and increase product recovery. Efficiently performs liquid/solid separation for red meat, pork, poultry, seafood or vegetables. Wedge-wire screens offer greater cleaning efficiencies, or reduce water requirements with an optional, patented Traveling Spray CIP option. 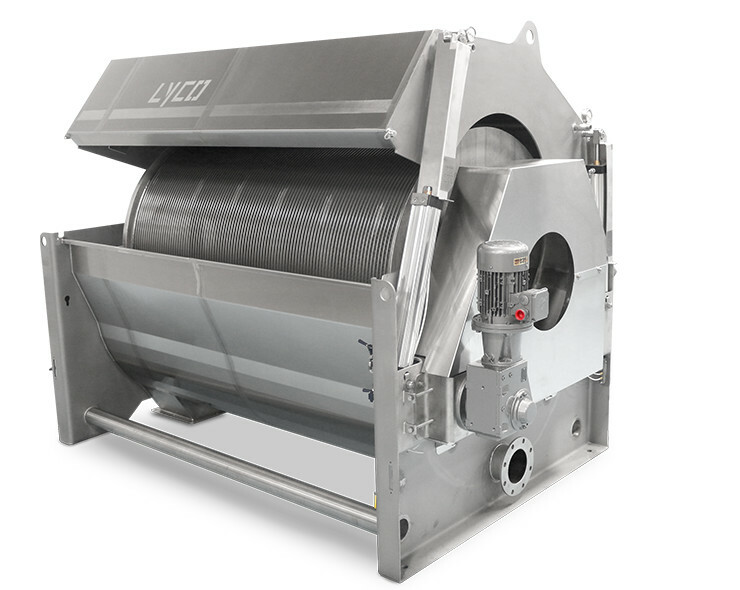 More operators rely on Lyco’s Single Drum Wastewater Screen than any other type. Cast Stainless running rings last forever. 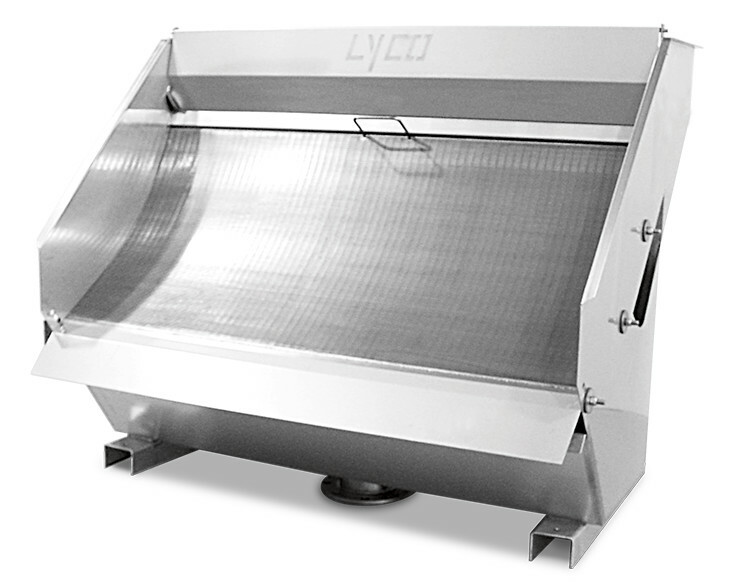 Lyco Manufacturing takes reliability to the next level with its Sanitary Zero Maintenance Screen design, eliminating trunnion wheels and bearings. The maintenance-free design removes the need for routine lubrication of the bearings. 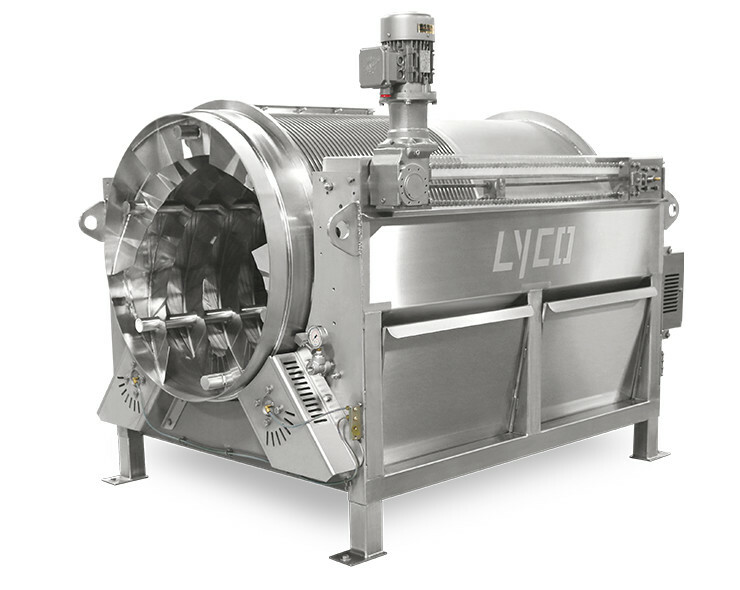 Lyco is known for making the most robust rotary screens in the industry. As with any machinery, chain and sprocket drive systems still require routine lubrication to ensure optimal performance. Processors can gain significant savings with the Micro Drum Screen system by reducing industrial waste and increasing product recovery. 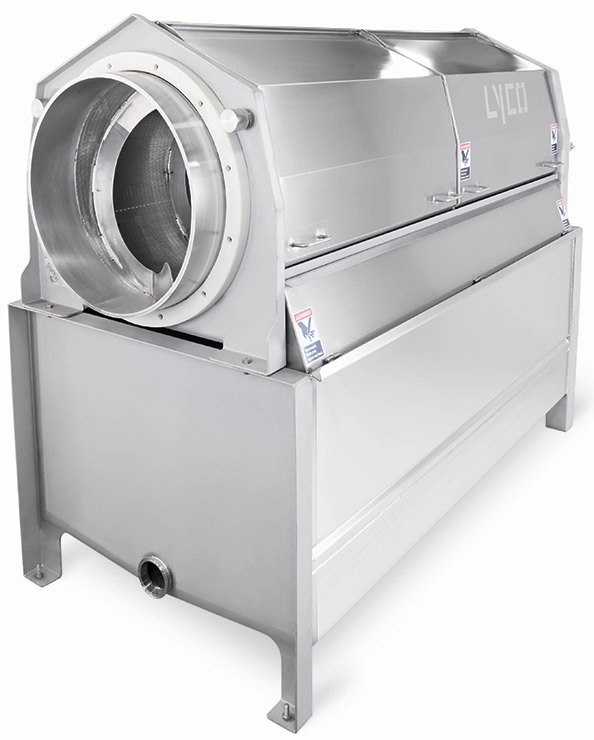 Lyco’s Micro Drum removes particles as small as .008″ – 60% smaller than the .020″ particle removal for typical screens. Test one of our Micro Drums and prove it to yourself. 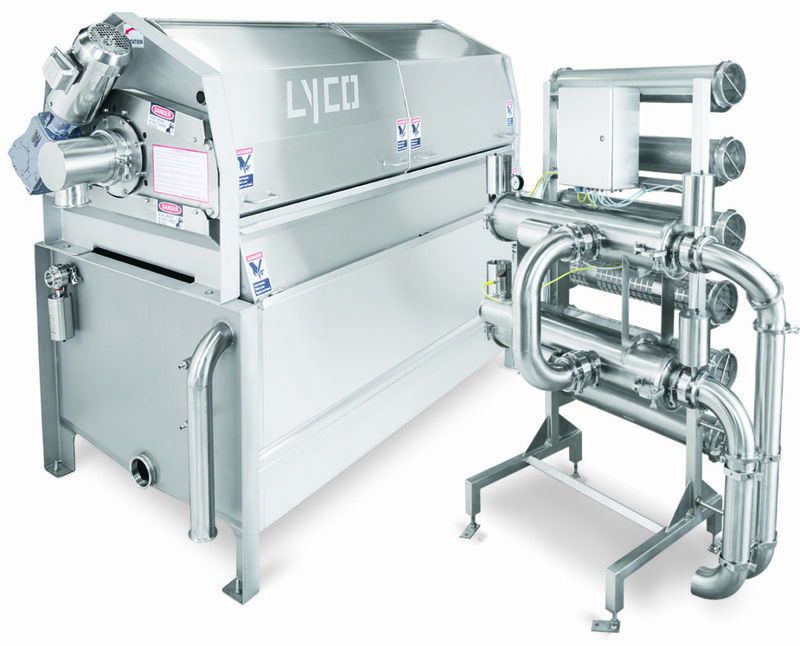 The Lyco Manufacturing Stationary Screen de-waters products, such as beans and vegetables, or can perform rough screening of wastewater. The wastewater function cleans up pea, bean, corn, potato or meat waste. Sanitary construction and a tilt out screen make cleanup a quick process. High-quality craftsmanship guarantees long life and performance. 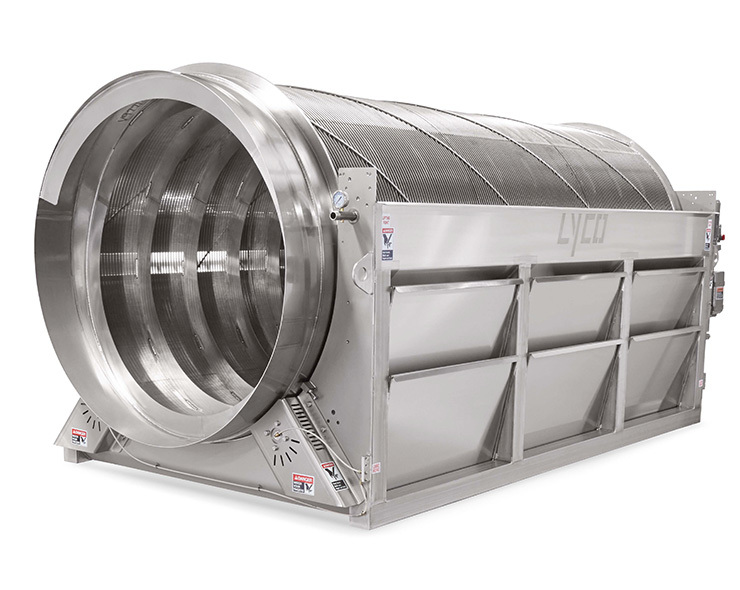 Sealed drum separator features enclosed construction that contains odors, improves liquid recovery and aids in temperature control. Perfect for rendering operations, this system effectively applies heat to extract moisture and separate fat, producing superior crax to the press versus a perk pan, to create rich, granular meals for animal feed or other industrial use. Drum slot spacing offers solids removal down to 0.020 to help reduce insoluble impurities and avoid clogs in screens, nozzles and other equipment further down the processing line. Captures a greater amount of solids to reduce waste and increase product recovery.